The oil and gas sectors went through a similar process. The most dramatic move on this front was the June 2005 government stock purchase in the mammoth gas company Gazprom, giving the state a stake of over 50%, a controlling interest. Thus Putin had effectively re-nationalized a company that supplies about one fourth of Europe's gas needs. This was neither the first move nor the last; the previous year the government seized a portion of the Yukos oil conglomerate over past-due back taxes, and since then has used its growing control over the world’s largest supply of natural gas to exert leverage on its neighbors and on Europe. 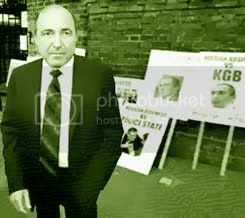 Berezovsky representing “Russian Business” outside the embassy in London, May 2004. The same day as his press conference, an official from Putin’s suddenly ominous government again blamed Chechnya and announced that Berezovsky was not to be trusted. In addition to his long-alleged links to Chechen mafia figures, he was also being investigated for links to rebel leaders and to the murder of a senior Russian police officer in Chechnya. Whatever protests they may lodge against the tycoon, London will not be likely to hand him over any time soon. ,  Simonov, Alexei. “Transformations of the Fourth Estate.” Original source: Nezavisimaya Gazeta. 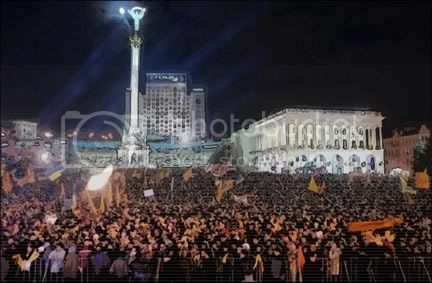 October 7, 2005. translation by Tatiana Khramtsova, appeared in Johnson's Russia List on October 10, 2005. Reynolds, Maura. “Ryazan Fears Darker Truth of Bombings.” The Moscow Times. January 18, 2000. Forward. October 31 2003. Via NCSJ.